A 40-year old male worker with a history of hemifacial spasm of more than 10 years duration and presenting with severe persistent headache and aggravating right facial spasm, was sent to the emergency medical center of Shengli Oilfield Central Hospital. Emergency computed tomography showed a hematoma located in the right cerebellopontine angle area [Figure 1] and multiple irregular high-density shadows in the cerebrum [Figure 2]. 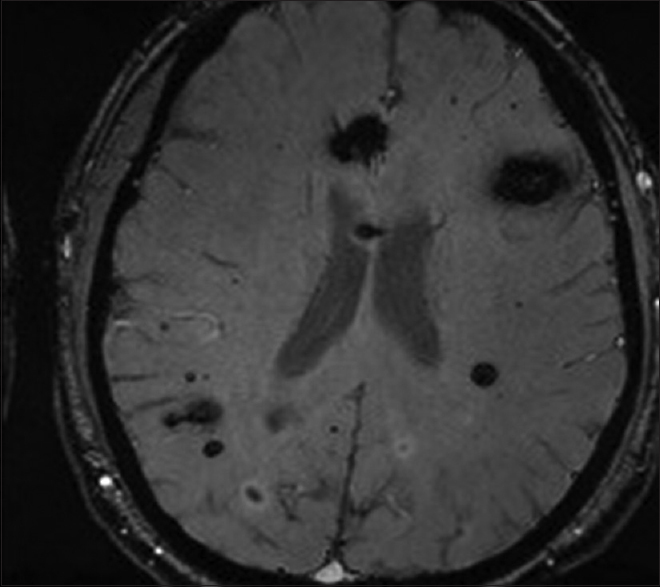 He was subsequently admitted to the department of neurosurgery where a magnetic resonance imaging examination was performed to ascertain the cause of hemorrhage. 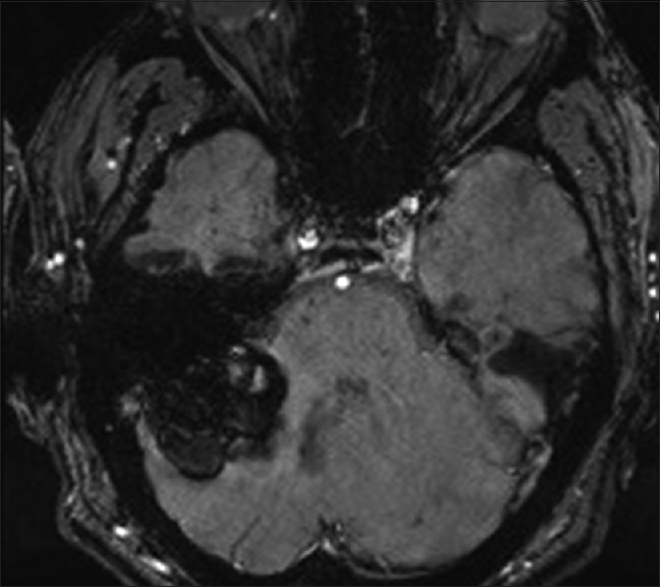 Susceptibility-weighted imaging demonstrated multiple intracranial lesions with low signals, along with a low-signal hemosiderin ring around a high-signal popcorn ball-like appearance [Figure 3]. 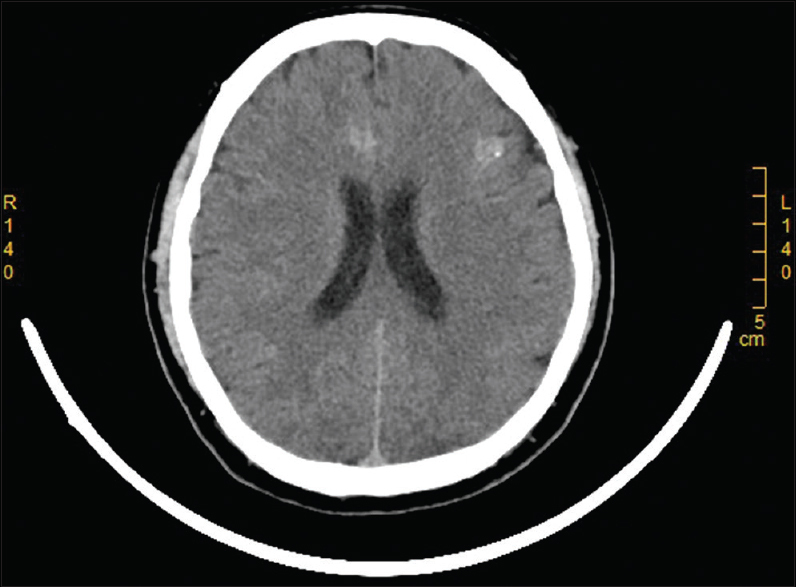 One of the lesions measuring 1.2 × 1.5 × 1.6 cm underwent hemorrhage in the cerebellopontine angle area [Figure 4]. 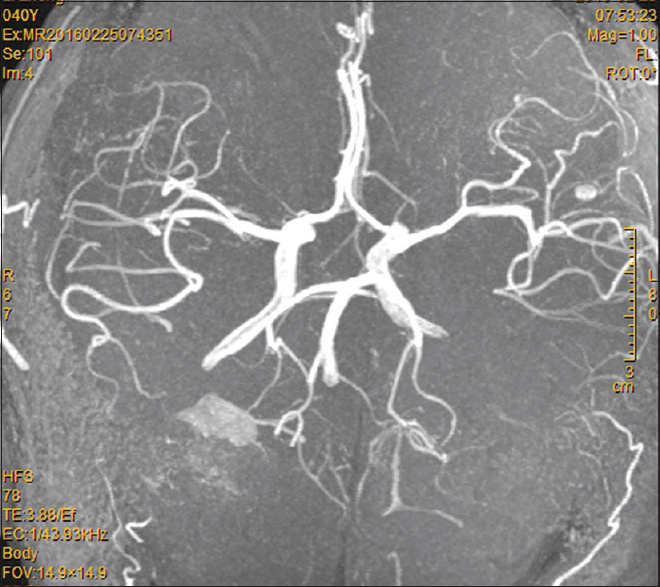 In addition, contrast-enhanced magnetic resonance imaging and angiography displayed two high-signal, vascular lesions [Figure 5]. 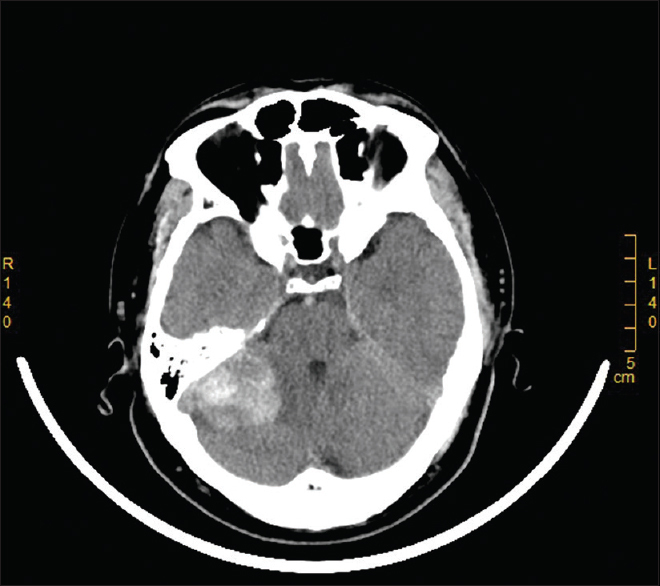 Surgical resection of the hemorrhagic lesion and removal of the intracranial hematoma were then performed through a right-sided retrosigmoid approach [Figure 6]. No cerebrovascular compression on the facial nerve was found during the operation. 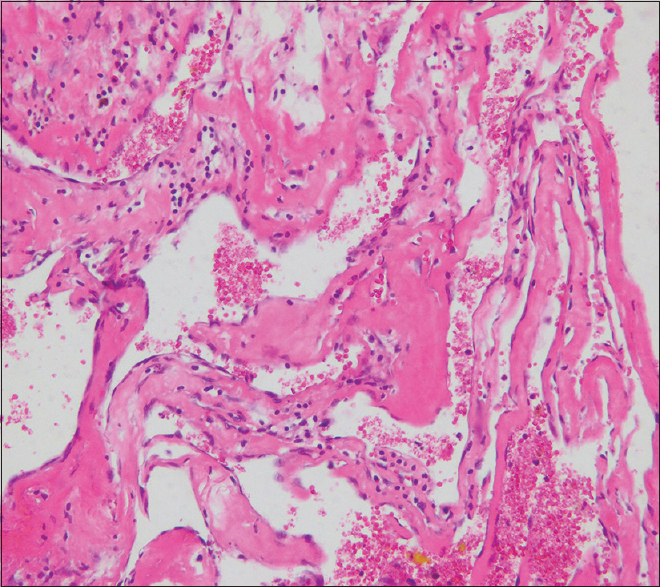 Pathological results showed the properties of lesion conforming to a cerebral cavernous angioma [Figure 7]. Therefore, the patient could be clearly diagnosed with multiple cerebral cavernous malformations. Postoperative examination demonstrated that hemifacial spasm had disappeared. 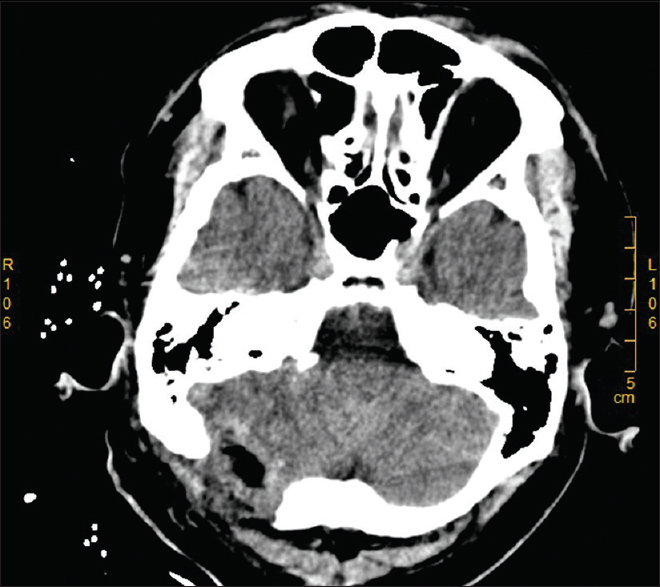 At a 12-month follow-up period after surgery, his headache was alleviated and no recurrence of hemifacial spasm was detectable. While it is acknowledged that hemifacial spasm is usually caused by a vascular compression on the facial nerve, often at its point of origin from the brain stem, a few studies have also shown that a cavernous angioma or a venous angioma may be responsible for hemifacial spasm as well, [Table 1]. In fact, both a cavernous angioma or a venous angioma have been directly implicated in the compression on the facial nerve from its point of origin at the facial nucleus. This also implies that the treatment of hemifacial spasm in the presence of an intra-axial brainstem hemangiomatous lesion, merely by microvascular decompression surgery, may lead to a poor prognosis. The enlargement of the cavernous malformation may result in progressive compression of the facial nerve. The natural history of cerebral cavernous malformations located in deep locations usually suggests a high risk for hemorrhage. Our case illustrated the fact that compared with other sites, the cerebellopontine angle may also be a significant location for the development of hemorrhage in a cerebral cavernous malformation, which may often be overlooked. We report this case to recommend that an early magnetic resonance imaging may be helpful in establishing the etiological diagnosis in the presence of long-standing hemifacial spasm; a vigilant attention must be paid to the risk of hemorrhage in the presence of a cerebral cavernous malformation located in the cerebellopontine angle area; and, an early surgical procedure is mandated to prevent the occurrence of this complication. The authors would like to thank Lixin Miu and Wei Su from the Imaging Center of Shengli Oilfield Central Hospital for helping with the images for this article. McLaughlin MR, Jannetta PJ, Clyde BL, Subach BR, Comey CH, Resnick DK. Microvascular decompression of cranial nerves: Lessons learned after 4400 operations. J Neurosurg 1999;90:1-8. Arita H, Kishima H, Hosomi K, Iwaisako K, Hashimoto N, Saitoh Y, et al. Hemifacial spasm caused by intra-axial brainstem cavernous angioma with venous angiomas. Br J Neurosurg 2012;26:281-3. Chen HJ, Lee TC, Lui CC. Hemifacial spasm caused by a venous angioma. J Neurosurg 1996;85:716-7. Kivelev J, Niemela M, Kivisaari R, Dashti R, Laakso A, Hernesniemi J. Long-term outcome of patients with multiple cerebral cavernous malformations. Neurosurgery 2009;65:450-5.